In most areas of the country, the Fall chill has pierced the air, and hot areas are beginning to cool down, moving steadily toward the freezing cold months of Winter. But anyone who lives in greater Tampa or the surrounding areas knows better — the hot sun isn’t going anywhere if you live in Florida, and even through these Fall and Winter months, anyone could be at risk of an air conditioning emergency. That’s why, at Benjamin Brothers, we offer 24 hour AC repair to everyone in the Tampa area and surrounding regions, such as Pasco County and Hillsborough County. While most air conditioning issues can wait for normal working hours, there are rare occasions where you should call someone ASAP. Let’s take a look at some air conditioner emergencies that you’re at risk of facing in your Florida home. Air conditioning emergencies can be considered emergencies for one of two reasons — they might be threatening your comfort to a degree that requires immediate treatment, or they could be a legitimate safety hazard. Most comfort situations don’t require emergency services, but they sometimes can. While being hot from a broken AC is miserable, it’s something that people can usually endure until they can call a professional. The Florida heat, however, is punishing, even in the “cold” seasons, and sometimes the lack of air conditioning can be legitimately dangerous. In other cases, a malfunctioning air conditioning system could actually pose a safety hazard. In rare cases, component failures could drastically worsen the air quality of your home, or even be a fire hazard. One of the most unfortunate side effects of a malfunctioning air conditioner in Florida is the effects it can have on your quality of sleep — if you even end up sleeping at all. Whether or not you like hot weather, there is one aspect of it that will always be true — high temperatures make it harder to sleep. This is something that has been proven by numerous studies. At best, insomnia is an annoying inconvenience that makes us tired and frustrated, both throughout the night and the next day. At worst, it has a debilitating effect on one’s mental faculties, performance, and can exacerbate any mental illnesses that already exist. For anyone who has some kind of affliction, excessively high temperatures almost never do them any favors. Whether it’s a cold, a fever, an injury, or any other kind of condition, they’re rarely ever helped by hot weather, and many times, they’re often made worse by it. If you or someone in your home has a condition that makes them sensitive to high temperatures, you shouldn’t get used to leaving them in a home where the air conditioner isn’t functional. People in other states might be able to get by without a solid AC system, but in Florida, you’ll know real quick just how unbearable things are when you don’t have some kind of cooling mechanism in your home. Even if you can endure the heat, it’s best to have others in mind if things are getting too hot. People who are weak are the ones that stand to benefit the most from a properly cooled home — the sick, the ill, the elderly, and tiny children come to mind. Sure, you may be able to handle it, but everyone in your home needs consideration. In these kinds of situations, it’s far better to be safe than sorry. First off, if you ever smell something burning in your home, it’s an adequate reason to stop what you’re doing immediately and investigate the situation. We don’t have to tell you why house fires are one of the most dangerous disasters your home and family could possibly face, so there’s nothing that’s more important than diagnosing the cause if you catch a whiff of that burning smell. Let’s be clear about something — it’s extremely rare that an air conditioning system fails so badly that it creates a fire hazard. Modern systems are designed with many checks and failsafes to ensure that it won’t happen. However, that doesn’t mean that it’s completely impossible, and if you smell something burning from your system or you see smoke coming out of any machinery that’s related to your HVAC system, call your nearby HVAC professionals for emergency repair immediately. At Benjamin Brothers, we are always willing to stop whatever we’re doing at a moment’s notice to serve someone who’s in need of 24 hour AC repair. However, the best scenario altogether is to ensure that you don’t ever have the need for it. The good news is that there is actually a lot you can do to prevent your system from having unexpected breakdowns or dangerous component failures. Air conditioning systems are like cars — if you neglect their maintenance, the parts begin to wear down, the mechanical performance gets worse and worse, and soon one problem spirals into another until your entire system is compromised. Perform Basic Maintenance: Routinely cleaning your air conditioner condenser unit and replacing your air filter every few months can go a long way into preventing future problems. 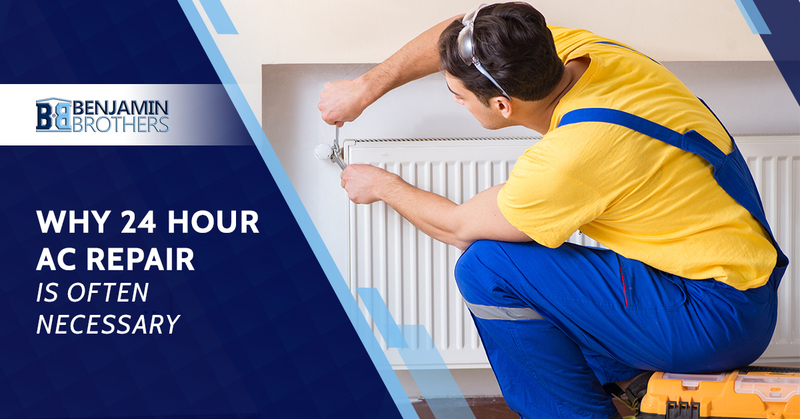 If you don’t have any idea of what kind of DIY maintenance you can do at home, your local HVAC professionals will always be willing to give you some recommendations. Call for a Maintenance Checkup Once a Quarter: Air conditioning maintenance costs can add up, so we understand why a lot of people don’t put it on their spending list every single month. But, if you make it a priority to get your HVAC checked at least once a quarter, you’ll add some meaningful longevity to your machine. Sometimes maintenance checkups simply hone your system so that it will perform admirably through the next season. Other times, our technicians might actually find problems you didn’t know about, and service them before they get out of hand. Have Some AC Repair Money Set Aside: One situation that often leads to air conditioning emergencies is simply neglecting to treat your system for an extended period of time. Few have the stamina to do this in the hot Florida heat, but it is possible. One way to avoid problems stacking up on each other is to have a modest air conditioning repair fund set aside. That way, you can repair problems immediately, instead of letting them fester into something much worse. Do you need emergency 24-hour air conditioner services? Look no further than Benjamin Brothers. We serve Pasco County, Hillsborough County, and just about any other region in the greater Tampa area. Air conditioner emergencies can result in safety hazards, so don’t leave your home susceptible — contact us today for air conditioner installation, repair, and maintenance!